...and, amazingly enough, they won! 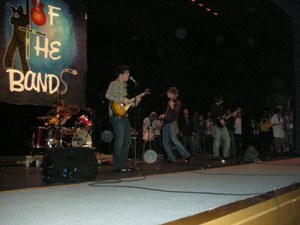 The band (from left, in the picture with the trophy): Sam, 2nd guitar and vocals; Chris (my guy), bass, class clown and vocals; Dan, drums; and Brian, lead guitar and lead vocals. I can be a proud pop, can't I?